DWG Search for your Desktop and Network drives. DWG Search is a specialized search program for quickly locating AutoCAD dwg files based on their names and content. This allows you to easily manage projects and drawings, reuse components and AutoCAD blocks. This innovative and powerful tool greatly reduces the time taken to locate particular components to be reused in your current and future projects. Users can search for block names, text occurrences, path and files names. The result gives a clear view of the contents of your folders and drives. This CAD file management application is suitable for large or small design offices, for Draftsmen, Designers, Project Consultants, Civil Engineers, Architects and Engineering alike. Using the DWG Search to query the database does not require AutoCAD to be installed. -DWG Indexer, a utility that searches and indexes data from AutoCAD files. This is usually installed on the administrator's or CAD manager's computer. Note that AutoCAD has to be installed on this computer. -A database to hold the relevant data. The database is usually placed on a network drive where all users can have access. -DWG Search, the application that searches the data is installed on each user's computer. AutoCAD does not have to be installed on these computers. • Search by text that is part of block definitions. Start the DWG Indexer. The first time you run the DWG Indexer you will be prompted to select the location of the database. After selecting the database location, click on Change Folder button and select the root directory containing the AutoCAD files. Then you can click the Start Indexing button. The DWG Indexer must be run periodically to refresh the database data. The interval depends on the work activity, the amount of new and modified drawings and the design office needs. 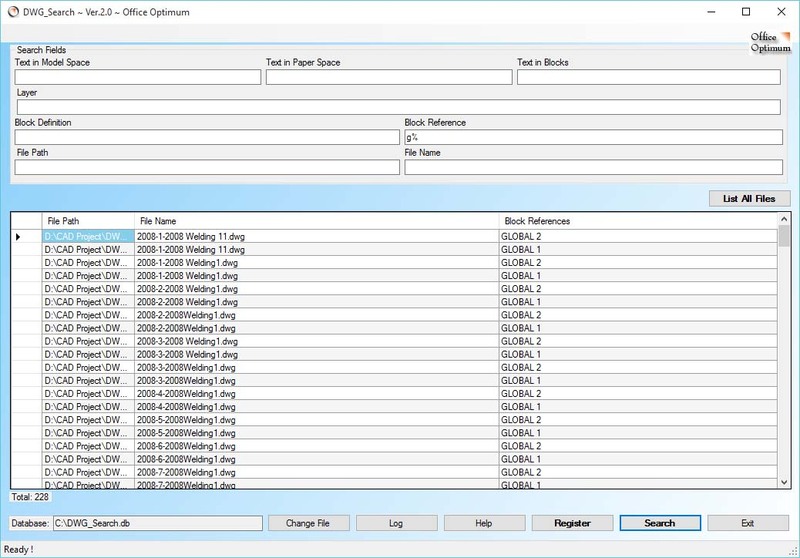 At the end of the indexing, the application will show the total files found, the total blocks and text items found. Note that the DWG Indexer cannot read files that are already opened by other processes or files of invalid format. The first time you run the DWG Search you will be prompted to select the location of the database. After selecting the database location, you can enter a few characters in the search fields. The database comes with data as examples for you to test and see its functionality. Each search field is treated independently and the application searches as you type. The results are displayed on the lower table. The information in the table can be selected, copied and then pasted in other applications as needed. You can search for text that is part of the AutoCAD block definitions, or text that is in Model Space or Paper Space. You can also search for block definition names or for path or file names of the AutoCAD files. You can see all available files by clicking on Show All Files button. The Settings button serves for re-selecting the database after moving it to a new location. This application is incompatible with AutoCAD LT!